We suspect you may have a lot of questions. Here are a few that we hear most often, and some responses. Please don’t hesitate to contact us if you can’t find the answer you need. No. this is a voluntary process. After committing a crime or harmful act, you may have fewer options in front of you, but this is one option you do have. You cannot be coerced by anyone to participate. We’ll offer information for you to consider with your family, an attorney, or anyone else who matters to you. If you choose the restorative justice option, you’ll be asked to take responsibility for your part in the crime or harmful act. The victim may have questions for you. You’ll be expected to be honest and respectful. You’ll also be asked to take concrete steps to make right by those you’ve affected. Each contract is different and is decided during the conference by the participants. You and any other individuals responsible for the criminal/harmful act, the victim(s), your support person(s) and the victim’s support person(s). A victim advocate may be present if the victim so chooses. Parents of juveniles, one or more members of the community, facilitators and law enforcement will be there as well. Attorneys play an important role in the criminal justice system. 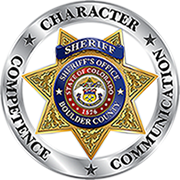 People referred to Boulder County Sheriff’s Office Restorative Justice (BCSO RJ) are welcome to consult attorneys but they do not typically participate in the restorative justice process. If you are disputing the charges, a restorative justice option may not be a good fit for you. What is the role of my family or other supporters? Your loved ones were probably affected by the harm in some way. Maybe your spouse got the terrifying call from the Sheriff’s Office in the middle of the night. Maybe your parents are making accommodations in their schedule for the restorative justice process. Your family might be ashamed, angry, or inconvenienced. In this process, family members will be invited to participate as supporters of you, unless they are your primary victims. You may also be making repairs to them for the ripple effects they’ve felt after the crime. Your family will not be answering for you. The focus will remain on your actions and what you’re prepared to do to make right. If there are other individuals that you would like to have participate as support, let the coordinator or facilitator know whom you would like to bring. After you speak with the program coordinator and a conference date is set your case will be turned over to two volunteer facilitators who will lead the process through the completion of the conference. The facilitators will contract you to set up an individual preliminary meeting with you and your parents or support person(s). This face to face preliminary meeting is held before the restorative justice conference separately with each party and is a time for the facilitators to explain the process in detail, to answer your questions, and let you know what types of questions may be asked of you. If you are a juvenile, the facilitators will ask questions designed to get to know you better- what your strengths are, what is important to you. The facilitators will lead the conference process in a safe environment where everyone has a chance to talk. Once the case is assigned to the facilitators, if you have any questions or concerns, please contact them directly. Will the conference be uncomfortable? Being held accountable may feel uncomfortable, but the process is designed to be respectful and honest. BCSO RJ facilitators will offer a safe space for discussion of harm, needs and repair. You will have a chance to prepare for the conference at your preliminary meeting, and at the conference, you should feel free to ask for a short break at any time. Many report that by the time they complete the contract, they feel a sense of accomplishment and that they are ready to put the harm aside and move forward with head held high. Who has to know about this? Our process is confidential. Each person who participates in the conference, including you, agrees to keep what they hear in the conference to themselves. Most people will want to share the restorative justice experience, and we ask that with respect for everyone involved, names and who said what not be shared. Certain community service sites may wish to know why you are doing service. It will be up to you to share that information. Will I have a record if I successfully complete the restorative justice process? If you were arrested and fingerprinted, the fingerprints are submitted to the Colorado Crime Information Computer (CCIC), and they will always be there. If you are not arrested but received a ticket or summons, it is indexed in the Sheriff’s Office internal records system called Tiburon. A public background check would show the ticket- unless we retrieve the ticket before it is entered into the system. If you did not receive a ticket because you agreed to restorative justice, you will still have a criminal history in Tiburon- which is only available to other criminal justice agencies (District Attorney’s Office, certain State and Federal agencies) outside of the Sheriff’s Office. Military, schools, colleges and potential employers have the right to request a local criminal history check but if you successfully complete your restorative justice contract, the offense will not show up on the public criminal history printout. The only military institution with access to Tiburon is the Department of Defense. Will I have to talk? Yes. During the conference, you will be asked to tell your perspective of the harm that took place, what you were thinking at the time, and what you’re thinking now. This will not be an inquisition, but your answers will help those who were hurt gain a better understanding. Beyond that, you’ll be asked what you’re ready to do to repair the harm. We’ll expect you to come with ideas to show that you’ve given it some advance thought. Review the community service sites as one option. Will I have to listen? Yes. The conference may be the first time you hear directly how others were affected by the harm you caused. It takes courage, but we encourage you to listen closely and show that you’re listening, too. Eye contact with the speaker, sitting in an attentive posture, even asking questions are all important. Can I back out once the process has started? We will explain the process thoroughly at the preliminary meeting. If you need more time to consider committing yourself to the process, we encourage you to do that. Once you agree to participate, we expect you to see through your obligations. Backing out may harm the victim(s) further. So stick with it! If you do withdraw, BCSO RJ will refer your case back to the deputy. Will the victim be angry? Victims have a wide range of reactions when they’ve been hurt. Some are very ready to move on. Others can be very upset. BCSO RJ encourages victims to express whatever is on their minds. Their comments can be heated, but the process will be respectful. What happens if I don’t complete the contract? At the end of the conference, you’ll have signed a contract that outlines the steps you’re taking to make right. If you don’t complete the contract, you will be causing further harm to the victim(s) and your case will be referred back to the deputy. If you commit another offense during the term of the contract, it may be revoked and referred back to the deputy. What will I have to do for my contract? Each contract is unique because each conference is unique; the participants consider the needs of the victims and the community as well as your needs and strengths. Some contracts include community service as well as written or oral reflections so that you can demonstrate what you have learned from the experience. A contract might also require apologies to those affected and restitution if the person harmed has experienced loss or damage to property. There is no precise formula and contracts can include very creative means of repair that use your skills and interests. What happens if I participate and complete all my obligations in the contract? Completing the restorative justice process suggests that you understand the impact of the harm you caused, that you’ve taken concrete steps to do right by the victim(s), the community, and your loved ones, and that you’ve learned something in the process. If the contract is completed with all items turned into the BCSO Restorative Justice office, you will be sent a letter of completion and there will be no further obligations for you for the incident. Congratulations!